SharpKeys is a Registry hack that is used to make certain keys on a keyboard act like other keys. For example, if you accidentally hit Caps Lock often, you could use this utility to map Caps Lock to a Shift key or even turn it off completely. The official release includes support for up to 104 mappings, an extensive list of available keys, and a “Type Key” option to help when managing mappings. As it relies on internal support within Windows NT, Windows 2000, Windows XP, Windows Server 2003, or Windows Vista you must be running one of these OS’s for this Registry hack to work. Version 2.1 addresses what I would call a complete and total boneheaded omission on the “Type Key” form. Version 2.0 included a newly design UI and was recompiled to use the 2.0 release of the .NET Framework. SharpKeys 1.1 is also still available, using the 1.1 version of the .NET Framework – read this post for more information. Hi. I thought your key mapper could help but I’m not so sure. The problem is that the @ symbol on my keyboard SHOULD be accessed by pressing shift and comma and the ” symbol SHOULD be accessed by pressing shift and 2. This was how the the keyboard worked on my old system (Pentium 2, Windows 98) but on my new system (AMD Athlon 64, Windows XP) it has transposed it. Even in putting my email address in for this comment I originally put tr”yner.me.uk and had to go back and correct it. I downloaded version 1.1 of your mapper but found that it only seems to do whole key remaps which would mean that I’d be ok for typing e-mail addresses but I’d have to hit the , key every time I wanted to type 2. The same applied when I downloaded version 2.1. Don’t suppose you know any way round this do you? @Tim – try AutoHotKeys – they do more custom mapping… I don’t even do the remapping in this, I just expose the Windows registry key. Well it turns out that the Language settings WERE the problem. I’d set it to English (UK) but it seems that whoever programmed the language selection bit of Windows seemed to think it was a good idea that when someone selects a new language for the set up to reset it to English (US) and just add the language to the list of languages possible on that computer without giving any hints that this is what will happen. To make things further complicated it still keeps US as default so that when I thought I had the problem licked I ended up with the same problems next time I restarted the computer. You need to actually go into the menu and select ‘use this language as default’. I did that and went one further by forcibly removing English (US) from my computer. If only I could do that in real life! It’s colour with a ‘u’, Biscuit not cookie, Nappy not diaper, Rubbish not trash and you only call it a bathroom if it’s actually got a bath in it! Oh and our pints are bigger than yours. Nyah nyah! Thanks for the help and advice. (Also to the other guy who appears to have his posts deleted – just good housekeeping to preserve server space I guess) I’ll keep the keymappers just in case I ever have need to use them for something else. The \ key next to the space bar is 00_56, and the one above the enter key (which can be remapped just fine) is 00_2B, So they are different keys! Ah, well then you should be able to remap it then. Hi Great work Sharpkeys. Do you have a list of codes that keys on Apple’s Macbook Pro generate? I am trying to map certain keys to work in Wndows XP but don’t know the code each of the redundant keys generate. Is there any application that can assist in determining this? Cool little application this is! However, I’m trying to map the volume up/down/off keys of a first generation Apple Pro USB keyboard and SharpKeys tells me it doesn’t know the keys pressed. Did you do any research into this keyboard? Further to my earlier post I have now discovered the ‘Type Key’ function, so please ignore my earlier query. The Fn key on Mac keyboard remains a mystery. Shouldn’t the scancode generated by other keys change if you keep the Fn key pressed? Doesn’t happen on this one! So, pretty much, what we have is what we have. Sorry I couldn’t be of more help with it though! I can´t seem to get it to work with print screen. I have an apple usb-keyboard, and I would like it to work on my Windows XP. I have tried both 1.1 version and 2.1, but it still doesn´t work. I have a swedish layout, could this be a problem? Well, Print Screen is difficult as is it. Much like Pause/Break, it’s a triple byte key value so it’s already hard to map – if it’s coming from an Apple keyboard with a Swedish layout…? No idea what that would do. One thing that I do know is that if the “Type Key” window doesn’t see it then there’s a good chance that Windows doesn’t see it either. Do you think it’s possible to allocate a hotkey to the CD tray eject? Not that I know of – there’s no “eject” button on most media keyboards and on notebooks it’s usually a hard coded hardware thing (meaning that Windows doesn’t handle it)… sorry! Yeah, that seems to be the consensus. My keyboard has the web keys and volume keys on it, and with only a few lines of code an exe can be made that will eject the tray. I hope to modify the Web:Stop key listed in SharpKeys as “E0_6A” to launch this exe instead, hence be my Eject button. Any ideas on where I can find this registry entry E0_6A? Furthermore (and not really related to your brilliant proggie) any idea on what the key should look like to lauch an exe instead of issuing the Web:Stop command? I’ll be getting a ThinkPad next week and would like to know if it’s possible to map Fn+Cursor to media buttons (play, skip etc. ), like on the new T60 (I’m getting a T42p). Which ThinkPad do you have, Randy, and which limitation does it have regarding Sharpkeys? Thanks for the great tool (currently using it to remap Capslock to Ctrl on my desktop). oh, just saq AutoHotkey. Will try that first. I can see that there is a key defined as LaunchApplication1 (aka F20) using ScancodeMapper.exe. If I could define the application as an exe that ejects the CD tray I would be all set… anyone know how I define what Application1 is? No idea. What’s Scancode Mapper? Anyway, I’ll keep looking for a way to perform this action without a TSR. If I ever find the solution I’ll post it here. Oh. Hah – I had forgotten about that. Well, what I can tell you is that MacBooks have an eject key and they had to do the same thing: they leave a service running to pop the disc out when running under Windows. When I write to the registry in vista beta two. I get this. System.UnauthorizedAccessException: Access to the registry key ‘HKEY_LOCAL_MACHINE\System\CurrentControlSet\Control\Keyboard Layout’ is denied. Oops. Looks like a permissions problem… one of two things: When it asked you “this is trying to elevate blah blah blah” did you say yes? If you didn’t please do. It never asked me this is trying to elevate blah blah blah, I am on the build number 5384. Right clicking on a link did not have run it as administrator is an option, however going to the executable under program files by right clicking gave me the option. That worked. Ya, the “elevate” option is different between builds and depending on the shortcut/link/EXE file being accessed. I am also trying to get the print screen functionality working under bootcamp on a mac book pro without any success. Well, SharpKeys does work on a MB and MBP running XP using BootCamp, but Print Screen is a very irksome and special key… it’s a triple byte key and it’s only partially supported via SharpKeys. Your best bet it to try something like AutoHotKey or Microsoft’s keyboard layout tool: they better support strange keys like PrnScn. Hm. Differernt user log in perhaps? You could try removing the keys, rebooting, putting them back and rebooting… I mean SharpKeys doesn’t remap them: Windows does… I wonder if something got munged some how? 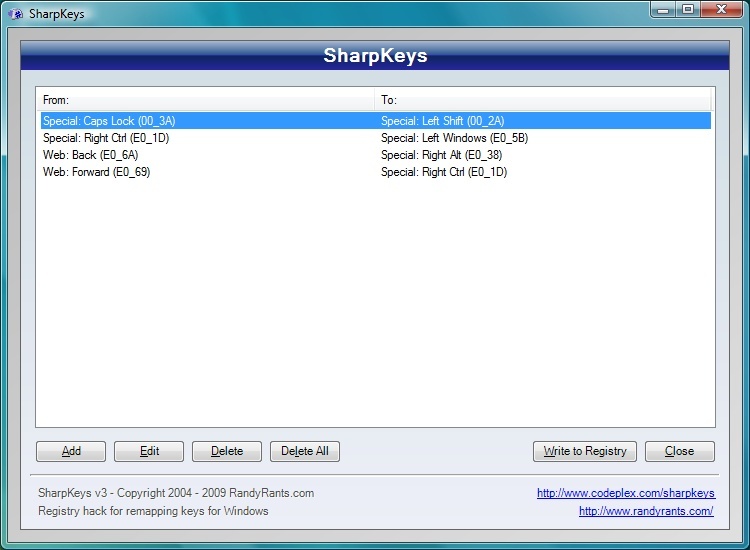 I have installed SharkKeys and also tried RemapKey. Both work on my internal keyboard, but neither will remap the Caps Lock key (I want it to be Ctrl) on a PS/2 keyboard plugged into a RadioShack PS/2 to USB adapter. Any ideas? Tried two different keyboards, wireless and wired. THe other keys I remap work fine (Alt, and Caps Lock), but Ctrl won’t function when assigned to Caps Lock. Sounds like the keys are getting lost on the PS/2 to USB conversion… lemme ask ya this: does Caps Lock work on that keyboard? Any chance that there will be profiles within SharpKeys so users (expecially those with laptops and external keyboards) could switch between home and work? Its a bit annoying having to delete settings and recreate them for different keyboards. so I just run the script depending on the keyboard. I still use SharpKeys to map Apple’s F14 to PrintScreen though! I tried removing the keys, rebooting, putting them back, and rebooting and it worked. A week later it has happened again. Both times the first time I noticed the problem were trying to use the t shortcut in Firefox. Shouldn’t matter: the keys are being stored in HKEY_LOCAL_MACHINE. I was just looking into that the other night, because writing things to that Hive is what requires you to “Run as Administrator” under Vista… there is no cooresponding key/path under HKEY_CURRENT_USER, so it couldn’t go there if I wanted it to. Gotta be under Local Machine which also means it should be impacted by a different user. Of course, if the keys are getting snagged by another application… like WinAMP has a “Global Hot Key” thing. Something like that could definitely screw up other stuff… not a clue as to what could be doing that though. So, what’s the deal with Apple keyboards on the PC? I recently bought an Apple wireless bluetooth keyboard (given that they’re the prettiest keyboards that still have the correct amount of keys and are wireless–I can’t stand those ugly keyboards with 324 extra hotkeys and a bulky design) and I’m quite satisfied. I knew from all the research I’d done on the keyboard before buying it that there’d be problems with the volume and eject keys, but I figured there would be some work around. I managed my way here and used your app for changing the f13-16 keys, and I’m quite satisfied. I ventured even farther and downloaded autohotkey, but after hours of searching forums, I gave up trying to figure out how to get my 4 remaining keys working. The biggest problem I’m having is figuring out what the keys should be, in respect to a scancode or whatnot. So here’s my main question: Does windows completely disregard these keys, and is it possible for me to map the at all, or are they impossible to map? If there’s even a remote possibility to get these things working, I’m sure I’d take the time and do it, but I’ve looked everywhere and I can’t find anything helpful. Anyone here have a suggestion? Can I map these keys or not? If AutoHotKeys can’t do it I would imagine that Windows can’t remap them. Over all it depends on what the keyboard is doing. If it sends the keys to Windows, Windows can remap them. If they aren’t then it’s a moot issue. Well that’s no good. Is there a verifiable way I can determine if the keys are doing anything when I push them? 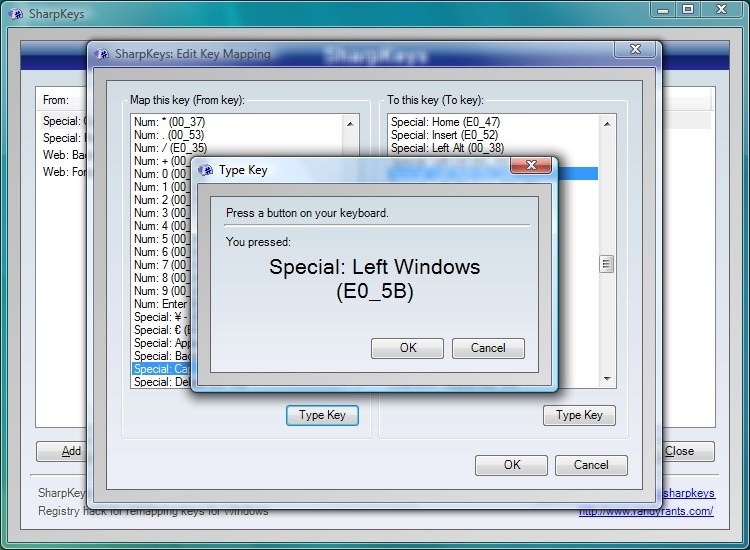 I tried the “Type key” function in SharpKeys, which did nothing for just those 4 keys. Any other way I could find out? I mean, this keyboard would be so much more badass if those keys worked right. Nope: it only remaps whole keys. Try AutoHotKeys for more macro related features. It also works on Vista Home Premimn edition! Thanks! i want to change or remap the keys of “@” (shift+2) and ” “” ” (shift+’). when I pressed shift+2 the result is the double quotation mark “. my OS is windows Vista. toshiba A200 Satellite model notebook. 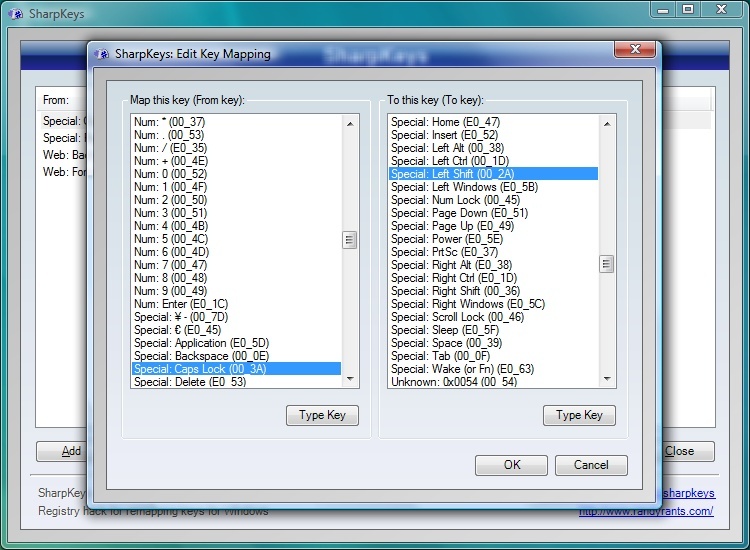 Sure ya do: SharpKeys remaps whole keys and not “half” a key… take a look at the FAQ or the comments here for more info. Can I assign F1 to keys Ctrl+Alt+Del? I can use just one hand. Nope – see the comments above about why and what some alternatives are. KTHXBAI! thanks for your great tool- one question. i have a mac pro running 64-bit vista under bootcamp. the keyboard works pretty well, but the alt (option for mac) key and the windows (command for mac) keys are position swapped on the keyboard. both function properly within windows (that is, they provide alt & windows key function within windows). when i tried to logically change them using your tool the alt key wasnt recognized by the “type key” input, but the windows key was.